The Sea Of Cortez is some 200 miles southwest of Tucson AZ, but a major influence on its climate. Tucson sits on a valley floor surrounded by mountains in the Sonoran Desert. The Sonoran Desert is covers some 110,000 square miles that includes Arizona and Southern California, and of Northwestern Mexico. Baja California and Baja California Sur are in this desert as well. The Sea of Cortez is a popular spot for local Tucson residence to vacation at; such as Puerto Penasco (Rocky Point) know for it’s wide white sandy beaches. 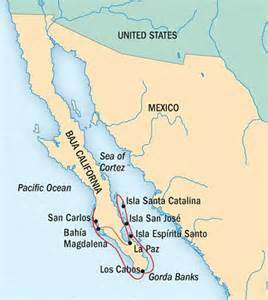 The Sea of Cortez also referred to as the Gulf Of California, is located in the middle of Sonoran Desert. This sizable body of water provides moisture that brings life to most desert species. The Sea Of Cortez leads some ecologists to refer to the Sonoran Desert as a maritime desert. The Sea Of Cortez is considered to be one of the most diverse seas on the planet. It is home to more than 5,000 species of macro-invertebrates. The Sonoran Desert area is divided into two halves by the Sea of Cortez. The Baja California peninsula to the west, and the Mexican state of Sonora to the east. The Sea Of Cortez was created some 6 million years ago when the Baja California Peninsula was pulled from North America. This event allowed ocean water to flow into the heart of the Sonoran Desert and bring life creating moisture to the desert lands. The Sea Of Cortez is 700 miles long and varies from 30 to 150 miles wide. It has an average depth of around 2700 feet deep. Interestingly, the surface area of the Sea Of Cortez is almost the same as the Sonoran Desert itself – 100,000 square miles. The Sea Of Cortez is the major contributor to the monsoon season rains in Tucson and Southern Arizona. As water evaporates, it rises into the northward flowing air currents. The higher summer moisture causes about half of Tucson’s annual rainfall. These annual monsoon rains are essential in maintaining the diversity of the Sonoran Desert. Without the monsoons, much of the plant life and desert amphibians would not survive. Only a few species anywhere that owe their existence to a single body of water in the middle of the desert in which they live. The Sonoran Desert is the only place in the world where the famous saguaro cactus can be found. Other cacti found in the desert landscape include the cholla, fishhook, prickly pear and organ pipe as well as others. These cactus varieties provide food and homes to many desert mammals and birds. The winter rains from the northwest make the Sonoran Desert bloom from late March through June. Desert flowers explode with brilliant reds, pinks, yellows, and whites pedals. The summer monsoons bring a second season to the desert floral landscape. The magic of the Sonoran Desert offers Tucson residence an endless list of things to do and see. The beauty of the mountains surrounding Tucson provide home sites with desert vistas and a backdrop for most Tucson homes. Spectacular desert sunsets that create back lighting for Saguaro cactus and trees that make the end of every day something to look forward too. Considering Tucson AZ as a future home or perhaps a winter retreat? We can help!